The EUR/USD continues advancing in a gradual manner, reaching the highest levels in over three weeks. What's next? The Technical Confluences Indicator shows that the pair is currently battling a tough level of resistance line at 1.1770 which is the congestion of the Simple Moving Average 10-15m, the 4h-high, the one-day high, the Boligner Band 1h-Upper, the SMA 5-15m, and the BB 15m-Middle. Looking dowm, some support awaits at 1.1748 which is the confluence of the SMA 5-4h, the SMA 50-one-day, the Bolinger Band one-hour Middle. 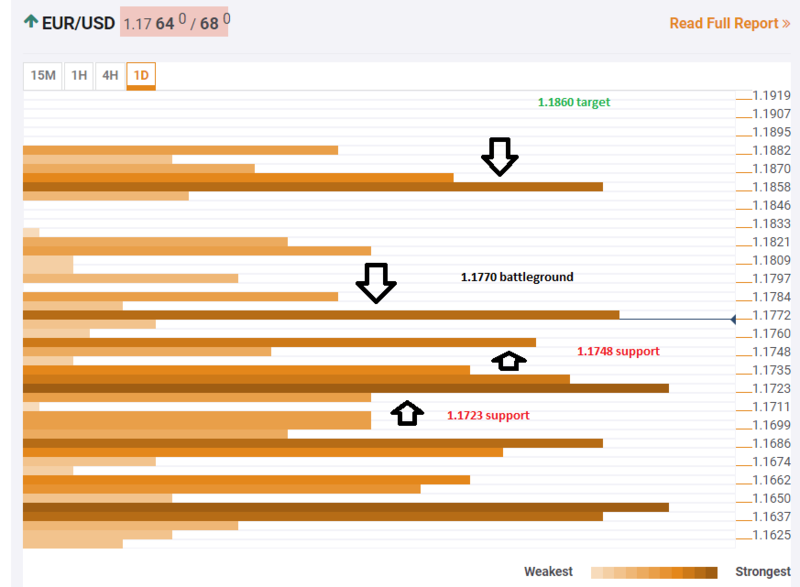 Much stronger support awaits at 1.1723 which is the meeting point of the SMA 50-1h, the Fibonacci 61.8% one-month, and the SMA 10-4h, among others. The broader picture shows that the pair has quite a few robust levels of support on the downside whle resistance levels are far and few apart.